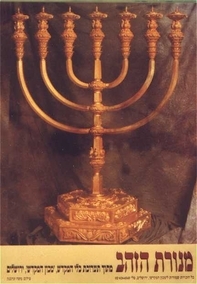 A Poster of The Jerusalem Temple Institute's reconstruction of the Menorah that stood in the Holy Room of the Sanctuary and which is presently located in the Jewish Quater. 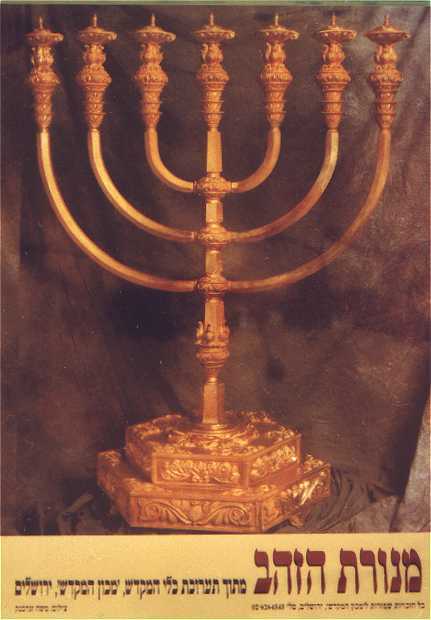 On the bottom of the poster is written in Hebrew: "Golden Menorah from the Temple Exhibit of Holy Temple, Jerusalem" History of the Menorah In the book of Exodus Moses was instructed to build a golden lamp stand with seven lamps: "And he made the candlestick of pure gold: of beaten work made he the candlestick; his shaft, and his branch, his bowls, his knobs, and his flowers, were of the same: "And six branches going out of the sides thereof; three branches of the candlestick out of the one side thereof, and three branches of the candlestick out of the other side thereof: The Temple Menorah was adjacent to the south wall, across the room from the table of shewbread in the Holy Place of the Mosaic Tabernacle and stood obliquely toward the east and south. Some sources say the three eastern lamps faced northwest - toward the center lamp and the three western lamps faced south east - toward the center lamp. The fourth or center lamp faced northeast toward the middle of the room. This middle lamp was called Ner Elohim, the "Lamp of God" as well as Shamash, the "Servant Lamp." It was also called the "Western Lamp" because it stood just west of the three eastern lamps. Each lamp held "six eggs" measure of oil which would last one day.